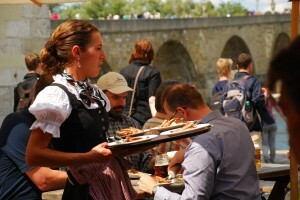 A waitress works hard at the Wurstkuche in Regensburg, Germany. She's not reliant on tips to make her good living. Tipping 20, 15 even as low as 10% of the bill in Germany is not required. What a relief for those who are tired of trying to figure out if a wait person earned it. Many who travel to Germany don’t know this. In Germany, unlike in America, waiters and waitresses don’t depend on tips to make a living. What?! That’s right, they are paid by their employers to do a good and professional job. And, they do just that, and then some. In fact, you can’t just decide at age 18 to “be a waiter.” You have to go to school for that in Germany. And, it takes about three or four years to be qualified for your first job. Yes, you have to work off the books as a waiter to pay for your schooling to be a waiter. Once you have your diploma you can work as a waiter or waitress until you retire, with full benefits no less. We see the same faces year after year at our favorite restaurants and Gasthauses and we’ve witnessed many times when someone will say “I’m retiring tomorrow.” That’s why some German restaurants will have minimal staffing, because to hire someone in Germany is to make a major commitment. I read complaints on “Trip Advisor” about some of my favorite small pubs and restaurants having “slow service.” Well, that’s because they are providing thorough service, and not rushing their customers out the door so that they can collect another inflated tip. In Germany, the average wait person makes $20 per hour plus tips. And, the tips are what they should be when the concept was first developed – “To Insure Prompt Service.” If you tip more than 5% in Germany you’re considered a fool – or, a tourist.